Sanjaya in Mahabharata: Find all detail about Mahabharata Sanjaya! Mahabarata Sanjaya means victory.When Mahabarata Kurukshetra was going on between Kauravas and Pandavas he had a Divya drishti though he can visualise events hundreds miles away.He had worked as advisor of the blind king Dhirtarashtra who is principal father of Kauravas.Mahabarata Sanjaya have a Power of seeing events by the sage Vyasa,Its is Giftted by god. 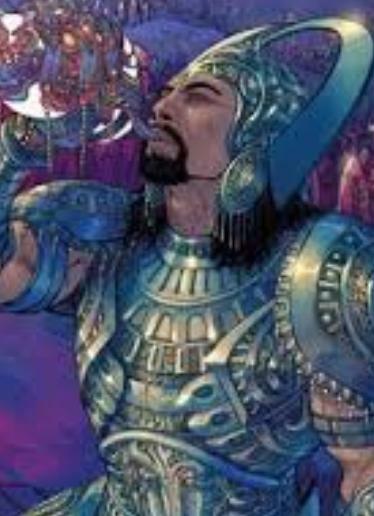 when battle was running blind king wabt to know whats going on in the battle then his son Mahabarata Sanjaya played a role to speak to King Dhirtarashtra . Sanaya in Mahabarata had duty of news of death of blind king sons by the hand of Bhima at different place at the time of battle and to inform all his kings. We are representing the information about Sanjaya 's role and Character in Mahabharata Characters.